I recently had THAT talk with a group of people. You know, the one that awkwardly happens when you and your husband are the new married couple in a mix of people who've known each other for years. You friend, stick out like a sore thumb and everyone wants to know urrrrrrrrrrything about you :) The conversation usually starts something like this, "So, what do you do for work?" "Oh me? I'm a food/lifestyle/fill-in-the-blank blogger!" ...."Oh! Cool! (Eyes light up) I love blogs! I read so many! The Pioneer Woman and A Beautiful Mess are my favorite. Is your blog like theirs?!" I mean, I don't blame them. Being a pretty new occupation, a lot of people aren't 100% sure what a food and/or lifestyle blogger actually does. For the most part, we bloggers don't get paid, don't get mailed boxes upon boxes of things to review, and don't really see a lot of "perks" as others would define. But that's not why we blog. We blog because it's our passion, our hobby, our way of making a difference in our community, our way of sharing the gifts the Lord has given us to the rest of society, a way to proclaim the Good News about the Gospel, a way to be a part of an amazing community of other bloggers, connect, and make friends around the globe, and so on. We didn't start blogging so we could buy a house on the beach and pay off all our student debts. In fact, I'd think it's safe to say some of us didn't even think there was money to be made in blogging at all! Yet we still started. If you're a blogger and that's what you're hoping for- for riches and fame and a blog just like Ree Drummond, well honey, you're in the wrong business and your mindset is starting off in this potentially awesome journey, wrong. You're setting yourself up for the possibility of huge disappointment. As I chewed on the conversations I had that night again, it got me thinking. "That's just my opinion. I wonder what other bloggers would say?" 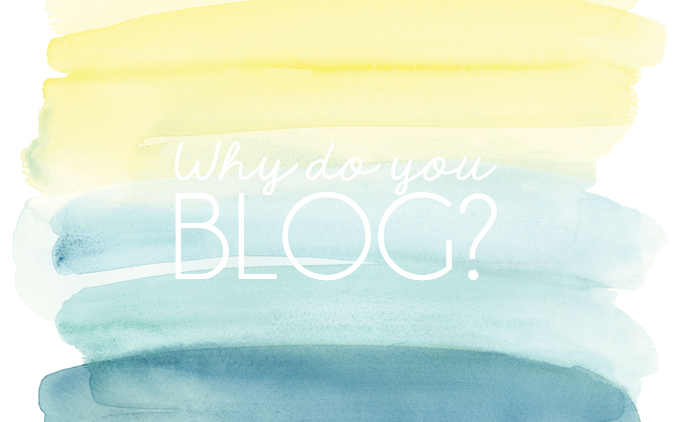 So I asked some of my best blogging friends these questions, "Why do YOU blog? When did you first hear about blogging and what inspired you to start a blog yourself?" and loved what their answers were! I started blogging three years ago as a way to raise awareness about the farm we were starting in the Sudan. The Baked Equation was started to raise money for our farm that was started in Torit, Sudan. Our desire was to teach the local village we were working with how to farm in season and then sell their goods to the surrounding areas. Southern Sudan has amazing natural resources. The people just needed training on how to best use them. The reason Southern Sudan is on the endangered food list is because 85% of their food is imported into the country, which makes it very expensive. For the past three years all the funds that I earned from baking and blogging went to support Micah 6:8 Sudan. But now things have changed in our family this year and my blog has become more of a marketing tool for my small business. My husband's company where I worked closed and I now needed to bake full time to help ends meet. At the same time civil war has broken out again in Southern Sudan. All outside missionaries were evacuated out and the farm has come to a close. While I still love to post recipes on my blog, I now focus more on sharing the cookie sets we are currently selling. I first started blogging in 2010 as I was just about to graduate from college, didn't know what I was doing with my life, and needed a space to write down my thoughts and keep my friends and family up to date. I blogged sporadically for a long time. I didn't know how to "do" blogging. I didn't understand it. My blog was just a place where I wrote down some thoughts or randomly shared funny videos. It wasn't until January 2013 that I started to blog "full-time." I started posting 3-5 times a week, organizing my content, sharing more readable material, and getting involved in the incredible blogging community. The past year and a half has been a whirlwind of a ride as I've learned a TON about blogging, advertising, marketing, and making friends in this online space. As my blog continues to grow, I hope it is a place where people feel welcome, where they can find true community, and where we can all learn from and encourage one another! I first heard of blogging from my friend Amanda- I had just moved out of the country & she had been my best friend while I was over seas. It started out as a way to keep in touch with her. Sort of a journal for the two of us. I could read hers and she could read mine. Over time I realized (as her blog grew and grew) that I didn't really have as much to blog about as she did, so I stopped. I started blogging again a little over a year ago. The inspiration for this one was my daughter. I wanted a place on the web I could share about her for our family to read, as well as recommend some of the great small businesses I was finding that made kids clothes, accessories & nursery decor for my friends & other moms who shared my style. It's grown into much more in the past year. I would surprise the me of years past by saying: "The reason I keep up with it for no pay, now, is the community of women I've found through blogging. 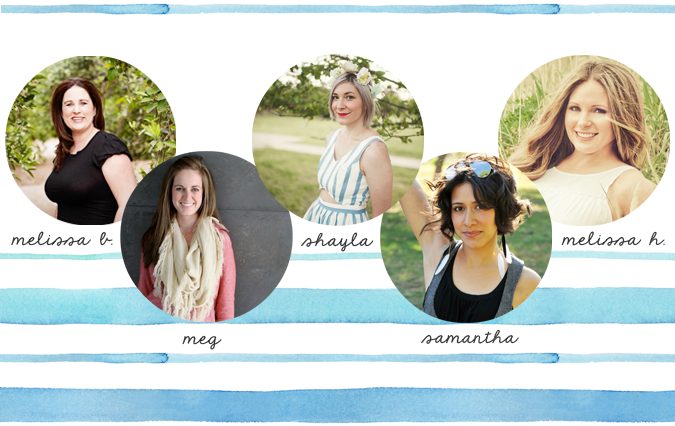 Be it other bloggers, or just ladies that keep up with my blog & comment here and there. The friendships I've made so far have blown me away. I don't ever want to risk losing touch." I first started blogging in 2009. At that point my sole purpose in blogging was to document my photos. I was not involved in the blogging community at all. At that time I just wasn't very aware of the blogging community. I took a break in 2012. I got married, moved to LA and got a new job. Lots happened in 2012. In 2013 I decided to quit my day job and pursue blogging as a career full time. Something that I knew was possible, but wasn't quite sure how to make it happen. I've been at it ever since. A lot happens behind the scenes in a blog, you have to be innovative, driven, pro-active, and always willing to experiment. I blog because I love sharing and creating content. I love sharing my faith and encouraging others. I also, really really enjoy collaborating with other brands and blogs. I first found out about the world of blogging when I began planning our wedding. From Pinterest I was directed to a variety of wedding blogs that were filled with beautiful inspirational photography and ideas that certainly helped me narrow down the feel and look I wanted for our wedding. Fast forward a few years, my wedding planning obsession turned to baby planning obsession after we found out I was pregnant with our baby girl, McKenzie. From photography & nursery decor to birthday party themes & baby fashion, I had so many inspirational photos and ideas saved to a folder on my computer until one day I decided to unload them all on the worldwide web. That's when "Fawn Over Baby" was born. It is the perfect place for me to share all of my daily internet findings with the addition of a few DIY projects by yours truly. It's a place where mommies and daddies can go to find a little inspiration on ways to create a bright and beautiful world to bring their babies home to. Just so encouraging. Love being in community with, and knowing these women personally. Not to mention seeing their amazingly sweet hearts, in their blogging and outside. Why do YOU blog, friend? This is super neat and encouraging, I didn't realize some of these bloggers have only been blogging full time for just over a year, and how much they have grown already. Can't believe some of these bloggers took a crazy bold step to quit their day jobs to do full-time blogging - very cool, very scary - would one day love to be able to do that! I started blogging because I really wanted to remember some of the little things, as well as the big things that God is teaching me, showing me and moving in me. I started This Pilgrim's Progress in 2010 and wrote a couple of things now and again, and at some point in late 2013 I wanted to start writing and sharing my thoughts, my life and life lessons, a way to share my love for creating images and the work of Jesus in my life and through it. I love everything you said about why you blog, it's about the community, sharing what the Lord is doing in your life, sharing the gifts the Lord has given you with the world, ultimately just sharing Jesus to whoever reads your blog. Love love love! It's nice to know that so many other women DO, and it's really encouraging! I love blogging because I am passionate about sharing the story that God has for me and my husband and our someday family. More than weddings and babies and big events in our lives is precious....it's the everyday stuff- what we did on the weekends, conversations, fun photos...I want to remember that stuff, and I want to share it with the world as an example of God's grace to us. Thanks so much for writing this! I was encouraged by all these ladies! I think it's because blogging, as a business or job title, is so new- people are still trying to get used to it. :) But, it's definitely on the rise so in a short amount of time, everyone is going to know! So happy to hear you love sharing the story God has for you! Isn't it the best? THANK YOU for coming by! So glad to hear you were encouraged! Thank YOU for participating sweet friend. I just love your blog so much! Love your heart for Jesus. This is such a wonderful post!! I'm so honored to be apart of this interesting and much inquired about topic! I love reading everyone's answers and blogging journey! Thank you so much for sharing Christina!! Oh, that awkward, awkward, awkward conversation. I know it well. I loved reading these answers! I blog for a bunch of reasons, but I think it boils down to the fact that I just really love writing. And I know that I wouldn't write nearly as much without blogging. What a wonderful post! After blogging for a few years, I am realizing how. much. freakin. work goes into this! I write my blog on top of a full time job. Although sometimes it is more work than I'd like, it gives me that "I accomplished the life I want" feeling at the end of the day. It really is my passion, and I'm so excited to continue and grow within the blogging community. What an inspirational post! Thank you so much for including me! it was so great to read everyone's responses! So encouraging! And I love this blog community! This was very fun to read and see everyone's perspectives. I am a new blogger, but I've discovered that it's just so fulfilling! It's fulfilling to create content and share it, and also fulfilling to read other uplifting blogs. I look forward to being inspired by other bloggers.